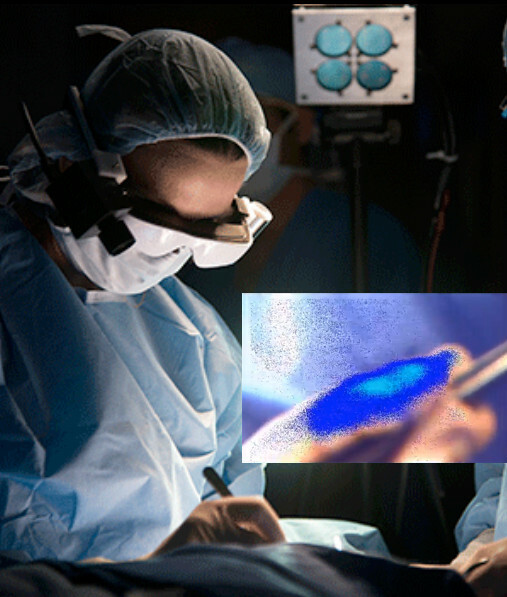 Washington University School of Medicine scientists have developed a wearable display to help surgeons visualize cancer cells, which glow blue when viewed through the eyewear. The wearable technology was used during surgery for the first time last week at Alvin J. Siteman Cancer Center at Barnes-Jewish Hospital. Current standard of care requires surgeons to remove the tumor and some neighboring tissue that may or may not include cancer cells. The samples are sent to a pathology lab and viewed under a microscope. If cancer cells are found in neighboring tissue, a second surgery often is recommended to remove additional tissue that also is checked for the presence of cancer. According to breast surgeon Julie Margenthaler, MD, an associate professor of surgery at Washington University, who performed the operation, about 20 to 25 percent of breast cancer patients who have lumps removed require a second surgery because current technology doesn’t adequately show the extent of the disease during the first operation. The technology, developed by a team led by Samuel Achilefu, PhD, professor of radiology and biomedical engineering at Washington University, incorporates a near-infrared light source, custom video technology, a head-mounted display, CMOS imaging sensor, and a targeted molecular agent (near-infrared quantum dots) that attaches to cancer cells, making them glow when viewed with the glasses. In a study published in the Journal of Biomedical Optics, researchers noted that tumors as small as 1 mm in diameter could be detected. In pilot studies conducted on lab mice, the researchers utilized indocyanine green, a commonly used contrast agent approved by the Food and Drug Administration. When the agent is injected into the tumor, the cancerous cells glow when viewed with the glasses and a special light. Achilefu, who also is co-leader of the Oncologic Imaging Program at Siteman Cancer Center and professor of biochemistry and molecular biophysics, is seeking FDA approval for a different molecular agent he’s helping to develop for use with the glasses. This agent specifically targets and stays longer in cancer cells. “This technology has great potential for patients and health-care professionals,” Achilefu said. “Our goal is to make sure no cancer is left behind.” Achilefu has worked with Washington University’s Office of Technology Management and has a patent pending for the technology. The research is funded by the National Cancer Institute at the National Institutes of Health (NIH). We have developed a near-infrared (NIR) fluorescence goggle system based on the complementary metal–oxide–semiconductor active pixel sensor imaging and see-through display technologies. 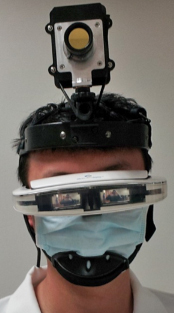 The fluorescence goggle system is a compact wearable intraoperative fluorescence imaging and display system that can guide surgery in real time. The goggle is capable of detecting fluorescence of indocyanine green solution in the picomolar range. Aided by NIR quantum dots, we successfully used the fluorescence goggle to guide sentinel lymph node mapping in a rat model. We further demonstrated the feasibility of using the fluorescence goggle in guiding surgical resection of breast cancer metastases in the liver in conjunction with NIR fluorescent probes. These results illustrate the diverse potential use of the goggle system in surgical procedures.